Cowie Technology designs, develops and manufactures PTFE Products supplying a diverse range of industries world-wide including Laboratory, Pharmaceutical, Process Chemistry, Bio-Chem, Electrical, Flow, Temperature Measurement, Aerospace, General Engineering, Cryogenics & Level Sensing. Dedicated solely to PTFE Technology, our specialist manufacturing facility, backed by our team of highly qualified engineers and chemists, enables us to offer exceptional value and quality covering a broad range of standard PTFE products and diverse options for the custom manufacture of PTFE products and components. Standard & Custom / OEM PTFE Labware for use in chemistry and chemical engineering labs. The Cowie Labware range includes PTFE Stirrer Bars, Stirring Equipment, Containers, Jointware & Reactor Lids. Standard & Custom PTFE Temperature Probes in PRT and T/C format for applications in demanding environments and as highly cost effective alternatives to conventional probes. 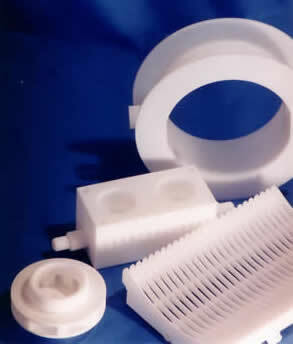 We manufacture Custom PTFE products in prototype or volume quantities using specialist compression and isostatic moulding techniques and precision machining. Custom products supplied include PTFE Valves, Seals, Floats & Insulators. Cowie supplies all industries world-wide from facilities in the UK & USA.